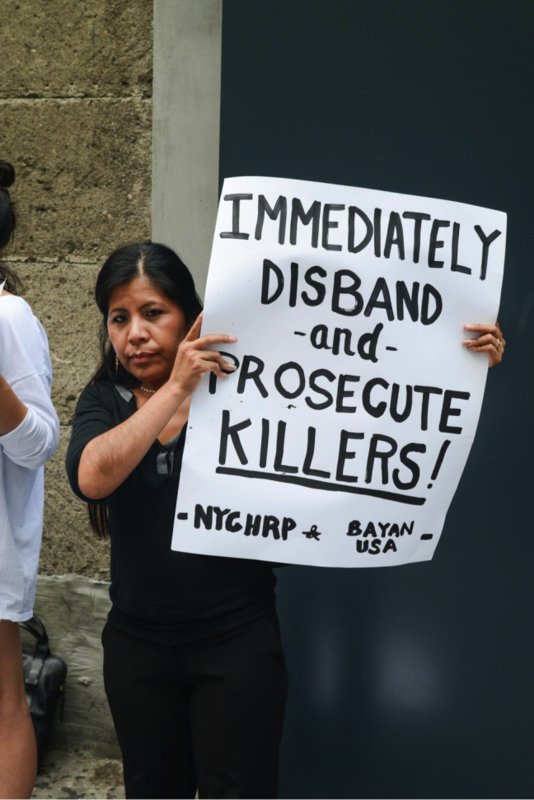 The New York Committee for Human Rights in the Philippines (NYCHRP) continues to stand in solidarity with you all as September 26, 2015 marks the 1-year anniversary of the 2014 Iguala mass kidnapping and massacre of 43 student activists. 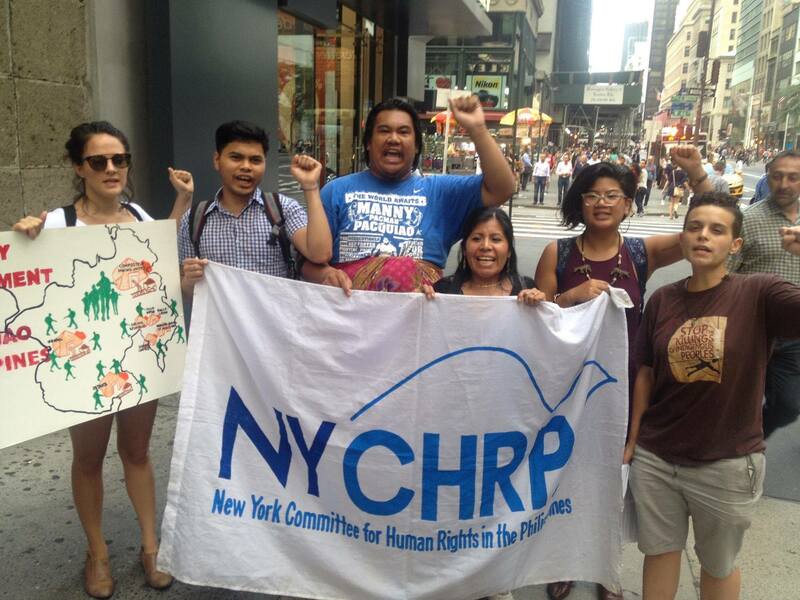 From the Philippines, to Mexico, to New York City, the crisis of enforced disappearances and culture of impunity that plague our homelands, pushes us to grieve together but more importantly, to build power within our communities to continue the fight for justice, peace, and liberation. The Philippines has shared common struggles with Mexico since the 16th Century, at the dawn of Spain’s development as a capitalist economy. Spain sought to extract and exploit the land, the resources, and the people of our homeland to feed the increasing greed of its growing bourgeoisie, and to serve its utter dependence to more advanced and insatiable capitalist societies. As a result of our peoples fighting for centuries against colonization, against the pillage of our homes, against the murder and abuse of our families, and the theft of our land and our heritage, the Philippines and Mexico were successful in ousting one colonizer! Here in the US, we have seen the power of cross-ethnic solidarity between Filipinos and Mexicans. It is because of the joined union of Filipinos led by Larry Itliong, Philip Vera Cruz, and other farmworker manongs and Mexicans led by Cesar Chavez and Dolores Huerta, that the United Farm Workers movement was successful in winning better wages and working conditions for farmers in Delano, California, and other agricultural hubs in the U.S. Despite our victories, our struggle continues. U.S. neoliberal policies such as the North American Free Trade Agreement (NAFTA) has wreaked havoc on Mexicans since the early ‘90s. The surge of American subsidized farm products put many Mexican family farmers out of business, subjected up to 20 million people into food poverty, and pushed thousands of hundreds to migrate to the North where they faced xenophobia and incarceration. Similarly, the Trans Pacific Partnership (TPP) threatens to do the very same and worse for the Filipino people. It is because of our shared struggle and the continuing systems of oppression we face from U.S. imperialism and state terrorism that we must continue to show up for one another. 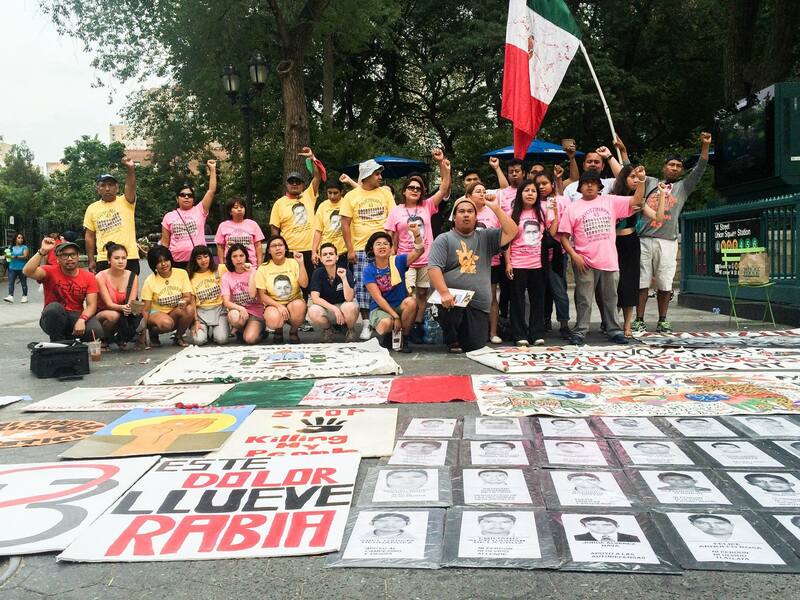 This year, on the International Day of the Disappeared, August 30, 2015, NYCHRP with Ayotzinapa NY planted 43 seeds in the memory of the Ayotzinapa students, and an additional 27 seeds in the memory of 27 Filipino activists who were forcibly disappeared under the current administration of President Aquino. Additionally, both communities helped each other in organizing, outreaching, and actively participating in holding international tribunals that hold their respective governments accountable for their human rights atrocities. Mexican President Enrique Peña Nieto at the United Nations General Assembly in New York recently addressed governments all over the world in his pledge for peace and human rights. But we stand strong with Ayotzinapa NY in calling out his farce speech, and instead are calling him what he truly is, a murderer! Nieto is a mirror of the Philippine President, Benigno S. Aquino III, who has attempted to wash his hands clean of the blood that his administration continues to execute from the murder of farmers in Hacienda Luisita to the recent killings of indigenous leaders in Mindanao committed by his Armed Forced of the Philippines, in which he also denied an independent UN fact finding and investigation mission. Nieto and Aquino’s talking points at the UN on human rights and economic development will continue to be false rhetoric and we must continue expose the truth behind their lies! NYCHRP is honored and filled with fervor to continue to build with Ayotzinapa NY. Your voice in calling attention to human rights in Mexico is not done in vain. We hear you and you hear us. We will continue to agitate, organize, and mobilize together even if our governments try to silence us and divide us by abducting, kidnapping, and taking away our friends and families to places where we may not know of even today. We should not relent to neocolonial and neoliberal forces that attempt to constrict our human rights and dignity. We must fight against imperialism. We must fight against NAFTA and TPP. We must fight to grow the seeds sown by our disappeared for a society that defends and protects the people from human rights abuse and exploitation. We must continue in their struggle and fight for justice for the desaparecidos. Oust Aquino! Oust Nieto! End US imperialist wars!